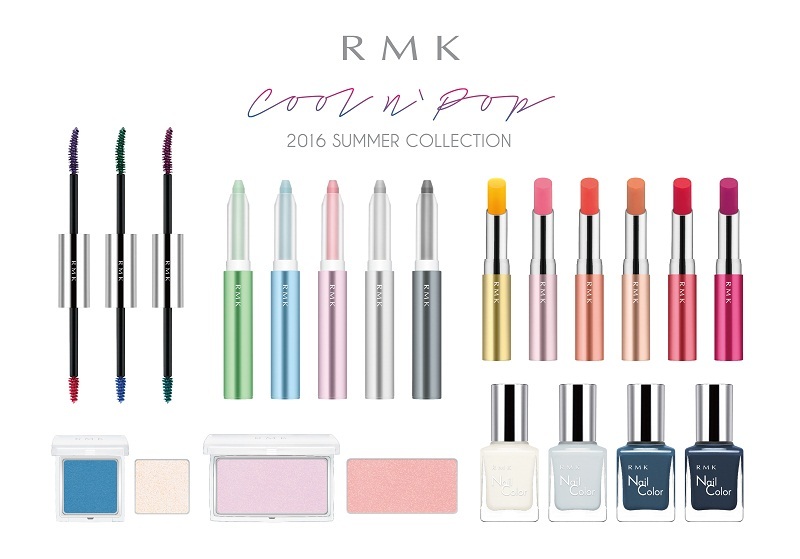 RMK's Cool n' Pop 2016 Summer Collection looks like a win from the get-go. The marshmallowy eye and cheek colors, the sorbet-tinted lip balms, and the candy-colored mascaras and nautical-themed nail polishes. Still, on closer look, it does strike me that this is a very quintessentially "Japanese Spring/Summer" collection. Doesn't mean it's a bad collection. If you have very pale coloring (pale hair, eyes, and skin) you will look absolutely gorgeous, which exactly explains the choice of model for the campaign. However if you have dark hair, dark skin and/or dark eyes, the colors can look a bit pastel and chalky, or simply not show up on you. If you love the look of the collection but you're not sure how you can pull it off with your coloring, here are a few tips. 1. Make sure you have a soft matte grey shadow in your own makeup stash, or you buy the grey cream shadow stick. This is the only shade in the collection that can give you any sort of definition around the eye area, so apply it around the socket line, outer corners of lids, and along the lash line so you can retain some definition and prevent your eye lids (especially if you have typical East Asian features) from looking puffy or flat. 3. 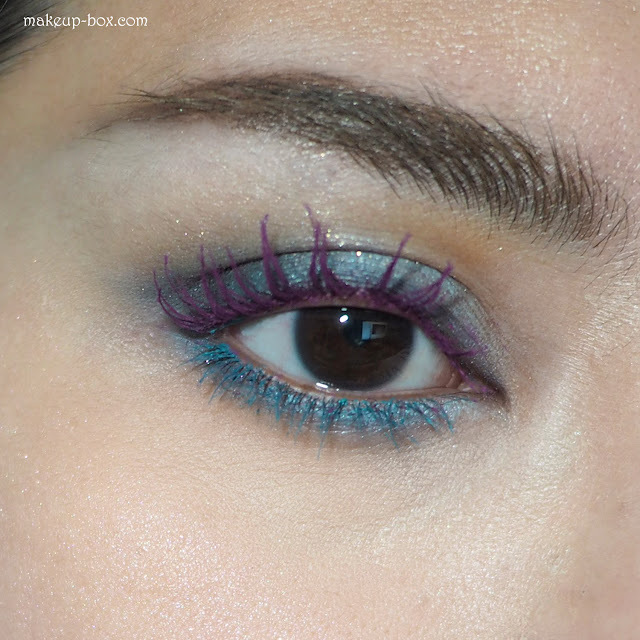 Be aware that if you have very dark eyes like me, colored mascaras can make your lashes "disappear" at a distance. A reason I avoid them usually. I personally feel this sort of look is more flattering for those with lighter eyes or colored lenses. General rule of thumb: Whatever is darkest stands out the most and makes everything else around it look "softer" in contrast. Just know that if you don't want your lashes to "fade", never go for mascaras lighter than your eye color. 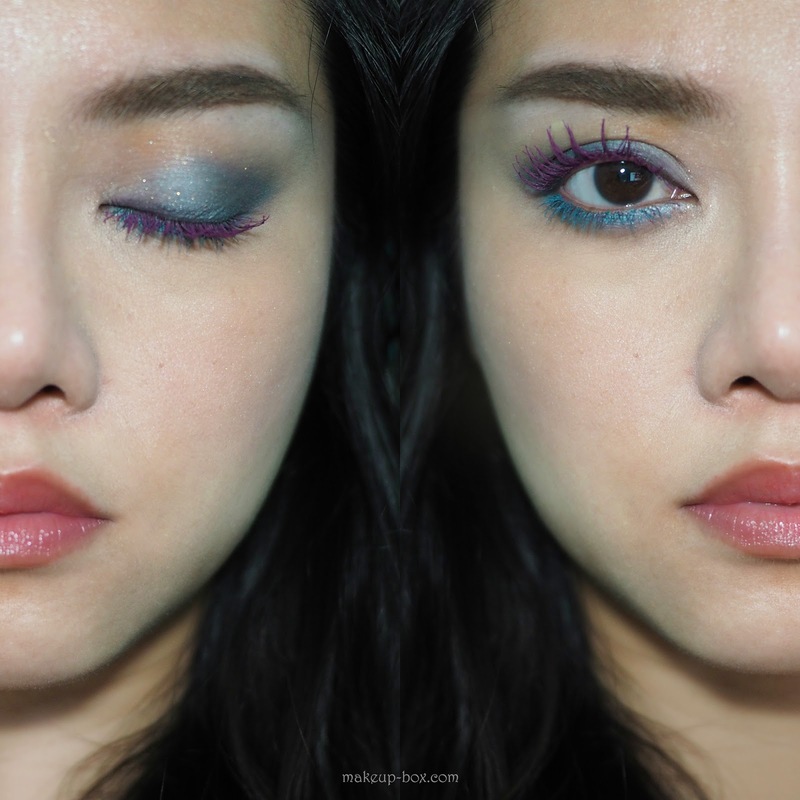 That said, this tubing mascara formula is fantastic, and if you're just looking to make a statement with funky colorful lashes, or you have light eyes, go for it. 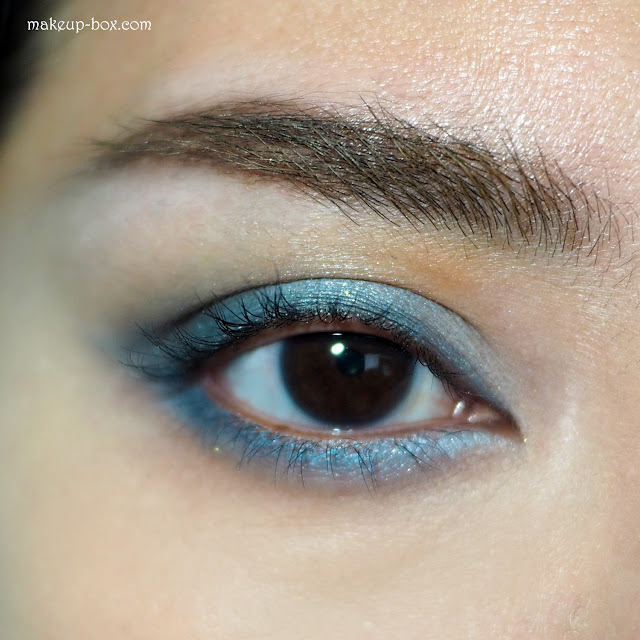 It is SO pigmented you can really tint your lashes quickly. And it is so long-wearing even oil remover doesn't break it down. You need warm water to break it down. And the final look re-interpreted on someone with my coloring! I did not apply the color the exact way Rumiko did on the model of course. I'm trying to test all the colors I got in one eye look and this is what I ended up with. I love RMK blushes and face powders in general, but I would skip the shades in this collection if you want visible blush and you are not porcelain pale. Go for other colors in their general collection. The lip tints I really like formula-wise - they have a subtle minty feel, and aren't too squishy and soft (I hate it when balm sticks break off at the tips during application). Only thing is you need to test on your lips to see what shade is visible. Your lips are rosier than your hand so just because you can see the color on your wrist does not mean it will show up on your lips. I love shade 05 (the soft red, worn above) because it is the one that is most visible on me. It just gives a soft warm rosy color and creates a healthier effect. I had been initially more excited by the deep berry shade 06, but the color barely showed up on my lips unfortunately. If you're just looking for a barely-there lip care product with a small amount of sun protection (SPF16) these are lovely though. As for the polishes? I tried 2 - EX-48 (cool ash grey) and EX-49 (nautical blue), and they are fantastic. I've used a lot of pale creme greys before, from Revlon to Chanel, and they've always been a touch sheer and streaky until you build up 2-3 coats or even more. EX-48 is so pigmented that you CAN technically go with 1 coat if you are short on time. And I just love the soft greys and the nautical blue shades. Your explanation is every time that clear and simple but detailed and precise that I feel like I have the same products at home and using them every day. You are doing a very very good job. The way of your make-up is exception and all the styles look so beautiful. There are many famous products available in the current market place. But it is your duty to understand which product is appropriate with the quality of the skin. The reliable paper writing services are providing some great tips on how to make an unique and beautiful make-up at home.